China has four times our population yet as director Tim Disney explains in the press release for American Violet, America has the largest prison population on the entire planet. The old joke among cops and lawyers is that when you walk into a prison, everyone is “innocent”... or so they claim. Yet when you take into consideration that 2 million citizens of our country are currently behind bars, you begin to wonder about the math especially when we're informed that 95% of those we arrest take a plea bargain even if they didn't commit the crime with which they're charged-- meaning no trial and no defense. 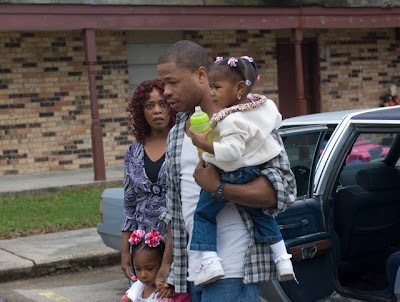 It's precisely this situation that 24 year old single mother of four, Dee Roberts (Nicole Beharie) finds herself in near the start of this mesmerizing, heartrending, startling eye-opener of a movie that's easily one of the best works of 2009. It opens with what the production notes reveal is one of the continuous raids unleashed on the poorest governmental housing communities in our country. American Violet's takes place in a relatively rural town in Texas and is set right around the same time as our country's most controversial presidential election in 2000. Apartments are ransacked and citizens are deposited directly into jail including Dee Roberts whom authorities track down serving coffee and breakfast at a local diner. Assuming she's being picked up solely for unpaid parking tickets, Dee is in for a miscarriage of justice system nightmare of the highest order when-- based on the testimony of one single, highly unreliable source who's facing criminal charges of his own-- she's accused of selling narcotics in a school zone. Locked up in a cell with her neighbors and away from her four young children, Dee debates her horrific choice. While the aforementioned 95% choose the fastest way out of jail that's possible, Dee understands more than just the moral and ethical problems of pleading guilty to a crime she didn't commit. Namely, she realizes that by being branded a convict she'll not only be ineligible to work in most professions but also lose all of her governmental assistance including the ones that help keep a roof over her four daughters' heads and food on their table. And as the film subtly implies, moreover and quite ironically she will then be ineligible to vote against those like President George W. Bush who “helped create the system"* in which she finds herself. Yet Dee has everything to lose unlike the legal hot water faced by celebrities who can buy their way out of any scrapes including the highest of charges with the right set of lawyers since the thesis of this emotional docudrama is the tragedy that money can purchase whatever kind of justice one decides. Thus if Dee simply abides with telling the truth that she is “not guilty” she risks more than ten years in prison as well as forfeiting her kids to child protective services. However, with a level of poise and coolness under pressure that I'm convinced a majority of 24 year olds would've collapsed under (including yours truly despite my initial hope I'd be brave enough to do the same), Dee makes an enormously risky but righteous decision. 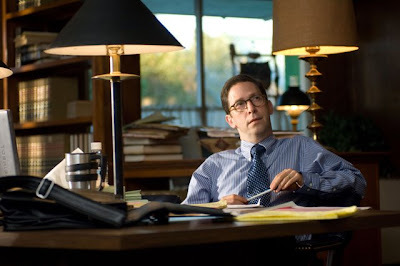 She opts to fight back when ACLU attorneys and a local former narcotics officer recruited by the team (played by Tim Blake Nelson, Malcom Barrett and Will Patton respectively) arrive to hold the power-drunk, racist, continually elected District Attorney (Michael O'Keefe) accountable for the lives he's destroyed. And despite overwhelming pressure to just give in especially by her own protective and worried mother (Alfre Woodard) who wants her to think of the future of her girls, Dee stubbornly stays strong in her attempt to make their eventual future far more just than the one at present. A dynamic piece of filmmaking that easily and appropriately earned the Heartland Truly Moving Picture Award for its quiet power, American Violet is further augmented by director Tim Disney's naturalistic style and Bill Haney's sharp screenplay that stayed incredibly true to the facts of the case that Haney had first heard about on NPR and found so devastating, he pulled over crying and phoned the ACLU. Having worked in both the documentary and narrative realm, Haney and Disney are obviously in their element given the political and socioeconomic subtext that occurs throughout. 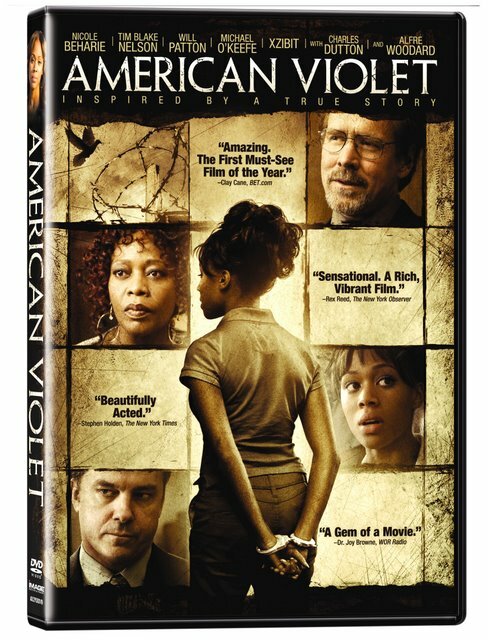 Yet admirably American Violet doesn't lose us by preaching its points. 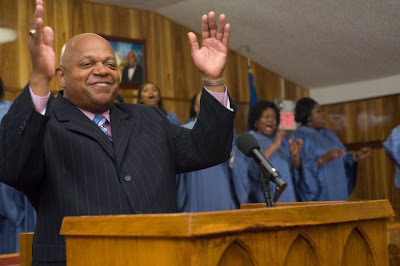 Likewise, it doesn't lose sight of its character and morph into a film wherein instead of a human being, Dee becomes merely a symbol for an overall "message movie" as in another Heartland '09 winner The Soloist which fell out of tune as it continued. In fact, the filmmakers make the most of their collaboration with gifted Julliard graduate lead actress Nicole Beharie in what is only her second role following The Express. They do so by never forgetting to remind us of the overwhelming situation and Dee's frustration combined with her age when the system ups their attack on Dee personally by trying to destroy her character and go for the jugular in the form of every mother's Achilles heel, which is-- of course-- her children. Instead of making her a virtuous saint throughout, the filmmakers use all of their research to present things responsibly from all sides, which leads to a few unwise decisions on Dee's part to battle her ex when he threatens to take away the two youngest children that he's fathered. 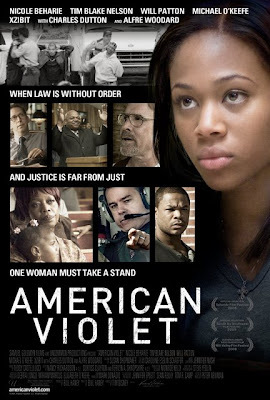 Although it was released earlier this year and due to a limited theatrical run not to mention its less than box office friendly subject matter ensured it was largely overlooked, I can only hope the film and especially actress Nicole Beharie won't be when awards season rolls around this year. American Violet is one to seek out indeed and a film that should be required viewing for anyone who votes or had that right stripped away from them in this country. * Quote from writer/producer Bill Haney from the official Production Notes for American Violet from Samuel Goldwyn Films.